My mom recently gave me a jar of ghee, an ingredient I’d heard of but never used before. Traditionally used in Indian cooking, ghee is a clarified butter. That means the milk solids have been removed from the butter, leaving only the pure fat behind. This is a good thing, because the solids are what cause butter to smoke burn at a relatively low temperatures. The ghee actually solidifies easily, especially as I’m keeping mine in the refrigerator now that it’s open, but it melts almost immediately when exposed to heat. Because of the high smoke point I used ghee to make popcorn, something I wouldn’t do with regular butter. 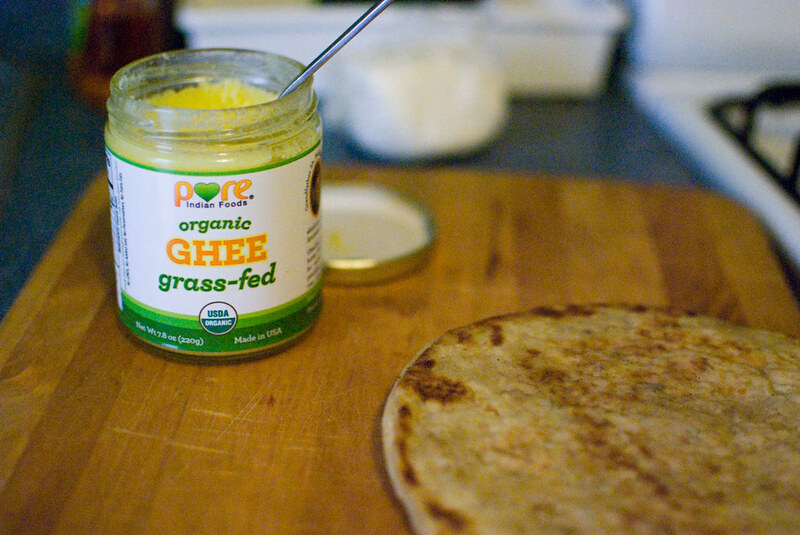 The ghee also came in useful when it came time to heat up some parathas I picked up from Patel Brothers in Jackson Heights. It’s turning out to be more versatile than I expected.